Are The Wine Wankers now part of the “industry”… really? A strange thing happened yesterday, well actually, it happened just over 6 months ago when we started this blog. As The Wine Wankers become more “known” (that feels a bit weird to write) people often ask how this whole caper came together. If you’ve read my very first blog post (click here) you’d know that we sincerely kicked all this off on a whim with no other intention than to blog about our wine stories. And if you’ve read Neal’s recent post here, you’d know that our namesake is rather ironic. The only purpose of this blog has been (and still is) to have a laugh and to share our joy of wine with anyone crazy enough to have entered the echo chamber. A strange thing started to develop right from the outset. We began to gain a following within the blogging community and became part of a great family… the WordPress bloggers. A few serious (and very good) wine bloggers followed us but an equal amount never really seemed all that interested. The real following we received was from other bloggers whose interest was not so much in writing about wine themselves but in actually reading about, and engaging in, our true passion for wine. Most are wine drinkers, of varying levels and taste, but we even have a few followers who read our blog just to join in the fun and they may not even drink that much wine at all. A little over 3 months ago, and after some encouragement from a fellow blogger, we decided to get onto Twitter because Neal was travelling through South America and we thought it might be a good time to give it a go. To be honest, for the first few weeks we didn’t get it at all, but I was determined. I watched what the more popular Twitter accounts did and noticed that they engaged with people, in a big way. They didn’t use Twitter to just broadcast content, like we were doing to our Facebook page at the time, they were chatting with people, sharing their stuff, and being shared in return. I soon realised that social media was about participation. The real core of our following though has been just good people who love wine and just want to have fun. We are so lucky to have so many truly engaged people that have joined us for this ride. We’ve now got close to 7,500 followers on twitter and about 10,000 across all mediums that get notified about the blog. From what we can tell it seems that this is quite a lot for someone related to wine in Australia. Recently we’ve actually started to creep out of our virtual world to meet wine industry people, something we’d never planned on. Our activity on Twitter has brought this about. On meeting people in the wine industry they seem genuinely curious about the whole “wine wankers” concept (a name that is hard to forget) and then even more curious to know how a few blokes not really connected with the industry can gain such a following. I suppose it might seem a bit weird to some. So we’ve had to ask ourselves, how, why, and we think we know part of the answer. We’re extremely passionate wine drinkers, that’s probably self-evident, but that’s not the full answer. It’s probably the fact that we aren’t “industry” that gives us our following. See, because we don’t have any of the constraints or expectations of the wine industry we can be totally free to just express ourselves as the fun-loving wine drinkers we are. Some people in the wine industry seem to find this difficult; wine is to be talked about in a certain way if you are to be accepted. 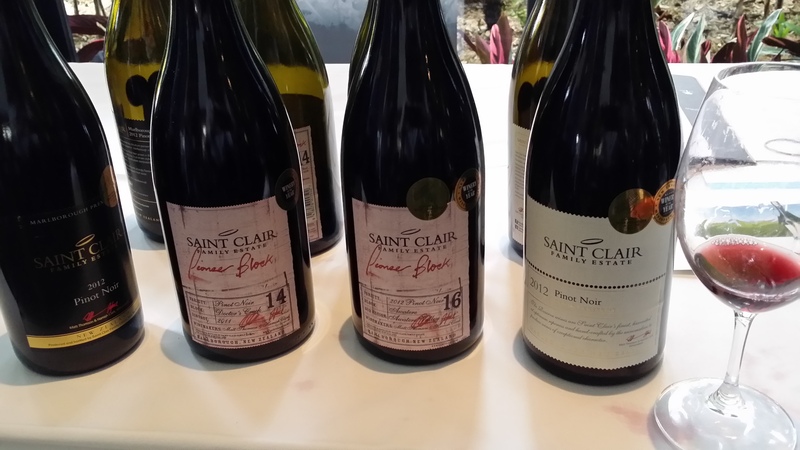 We don’t have to write about wine in a particular “acceptable” style and we don’t have to prove to anyone else in the wine industry that “we know our stuff” (there’s so much we don’t know that we hope to discover). We have no barriers, none. We’re free to “muck-around” and have a laugh, and those who follow our blog and twitter feed know this… we’re just fun loving passionate wine drinkers sharing the love! So what strange thing happened yesterday? Alex from Vinus (he has created a great little FREE wine app for the iphone you all should download from here) replied to a tweet we were involved in and mentioned a NZ wine tasting trade-related event. I wasn’t aware of the event (not being in the industry and all, busy with my day job and home life) and I got a reply saying “MAAATE! Missing out”. I did feel a teensy bit embarrassed for not being up on the event and asked if anyone could pull strings to get me in, and of course, Alex did. 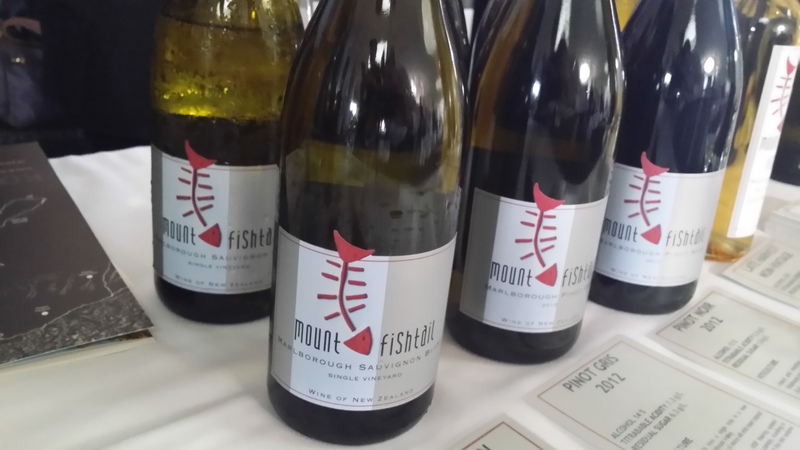 I won’t go into the details of the event other than to say I tasted some extremely good wine and this wine makes up the photos I’ve attached to this blog so please check them out – they are ALL very much worth getting hold of. 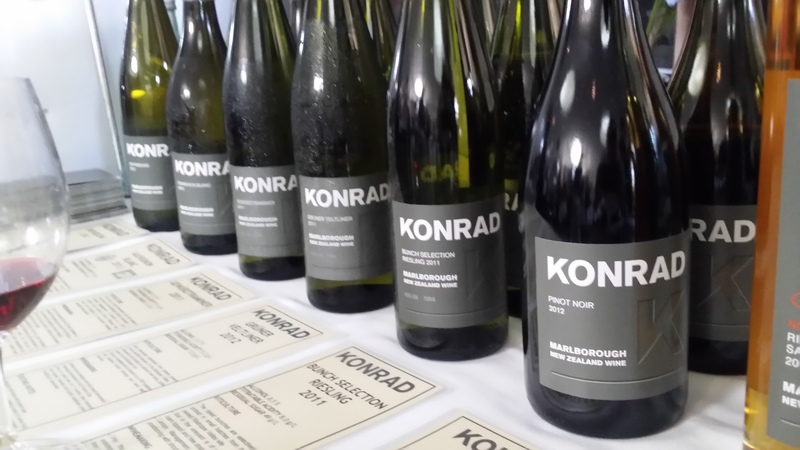 I was especially drawn to the wines of Konrad and found them to be of exceptional finesse, not being biased at all, really! 😉 NZ is known for producing some great Sauvignon Blanc but there’s so much other good wine especially the Chardonnay and Pinot (yum). The actual bit that weirded me out yesterday was a conversation I was having with Alex where I said that it felt weird being “snuck into” the trade event as “industry” and Alex responded along the lines of “Hell yeah, you guys are industry!” and also mentioned our growing twitter following. Hmmmm, at that point it hit me.. are we now part of the wine industry? Geez! Just like I said in my very first post, I still don’t know where this is going, but I do know that we’ve hit onto something through chance and passion that seems to work and also seems to be missing out there. We will continue to keep our minds free from having to conform to any industry norms because, as far as we are concerned, we’re still just passionate wine drinkers that happen to tell the world about it. Previous How do you choose wine for a table of 12? 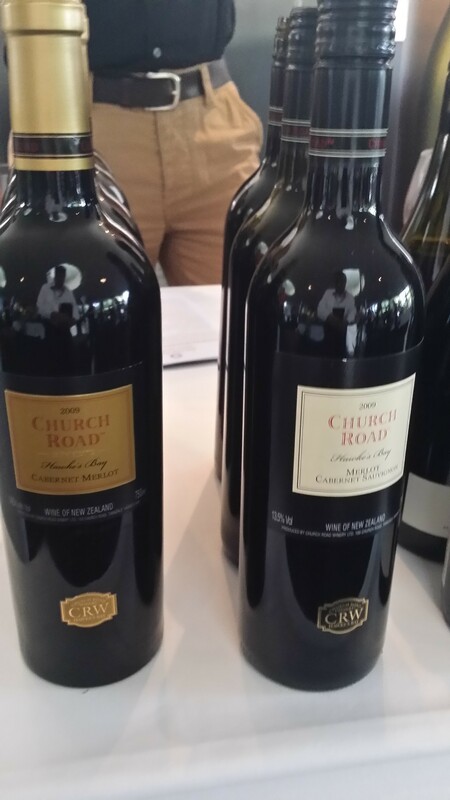 Next Drayton’s Family Wines, great food friendly wine. Congratulations, Conrad and the other guys! Loved to see your success! Hello there! Thanks a mil for your kind words. Prost!! Congrats on your success! My dad always said that it was important to not only know which wine goes with what food but what cheese makes a good partner. He even made a list and I so wish that I still had that list but perhaps it is still floating around somewhere. 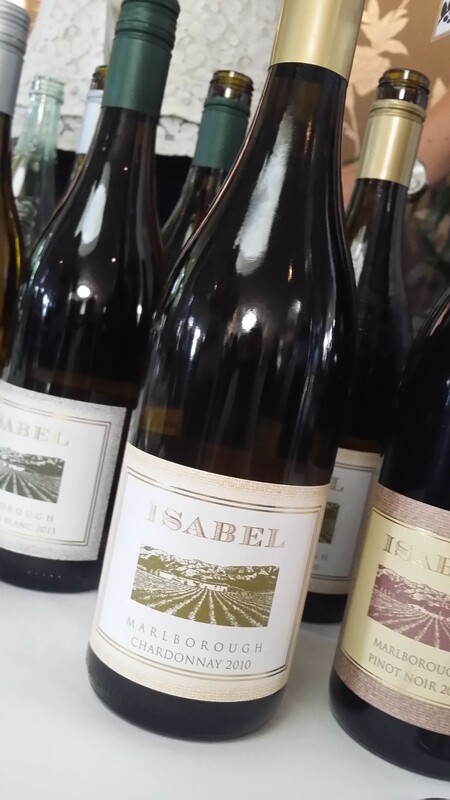 I love reading wine labels and learning about the best wines. Sounds like that list would have been a good one to keep as a reference. Sláinte! I don’t know much about wine, but I’m still enjoying your posting about it all. Please don’t become part of the industry! That is precisely the moment when wine ceases to be fun and wine industry professionals start to mock you for not drinking or knowing enough about outlandishly expensive burgundy. My aim to put the fun back into wine prevails this year… so just drink it and enjoy it and keep doing what you do, don’t be sucked into making it anything more than good old fun (in moderation of course). To be honest, there’s not much chance of us actually really being part of the industry in the traditional sense and we’re happy to let everyone know that there’s a lot about wine that we do not know. I’m glad there’s so much that we don’t know because it means that we have a long-life of wine discovery ahead of us. Telling people about our wine journey of discovery is what makes this all so much fun. If you mean great at self-promotion then we’ve got it covered… 😉 It’s all a lot of fun and it’s good to see you around again. Cheers! Seems to me your next step is submitting to newspapers in food and drink section and dining magazines and perhaps get a permanent column in print media which could lead to syndication and $. You could also write for brand promotions. Thanks Carl for your confidence in us but that all sounds a little too serious and would probably take us a bit too far away from our roots. Who knows, maybe what we are doing now, naturally, will become the modern version of the mainstream media you mention. Hmmm, that would be weird. Cheers! Ride it, gents! If it puts more wine in your vicinity and everyone knows you’ll only say what you truly feel, it’s all good. Awesome post. Blogs like yours and many others are part of the new evolution of media, entertainment, information or whatever you want to call it. An uncensored view from people who are not confined to rigid and ridiculous rules. Perhaps you may start some sort of podcast in the future as well! Well done, guys! I think PASSION is the key — average people can so relate to your posts, and even connoisseurs can learn a thing or two. Keep up the progress! Well done, it’s great to see some grass roots ‘wine wankers’ making something that everyday people can relate to with wine… looking forward to more blogs! I grew up in Santa Barbara, California where wine is a big deal (lots of the places in Sideways are my old stomping grounds!) , but even knowing so little about it, I’ve enjoyed your wine-dedicated site tremendously. You make wine more relatable to me all the way from Australia than my southern california roots ever did- and I’m sure I’m not the only one who feels that way. Well done creating an informative site that’s truly fun to read!